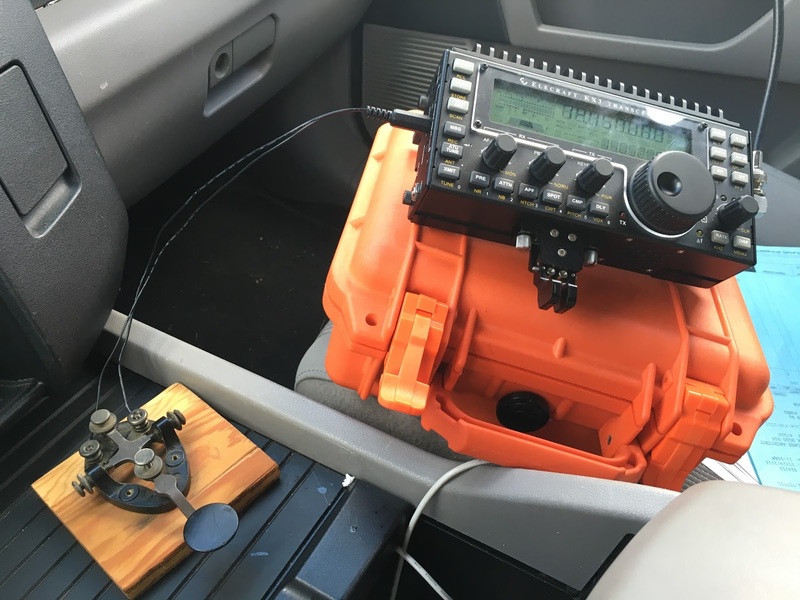 N0HYD - QRP & Portable Adventures! : Portable Ops 18/45: 20 Meters was good today! I finally got a chance today to play on the radio - my first time on the air since the SKCC WES! Much to my enjoyment 20 meters was actually playing nice for me! I went over the local park near my office and got set up - it is a absolutely beautiful spring day here in Kansas. After tuning around a bit and not hearing anything, I decided everyone must be listening and nobody seemed to be calling CQ - so today I decided to only call CQ! AI4UL (6327) - Bob gave me a call from North Carolina with a nice 559 signal - he gave me a 569 report. VA5CW (4326S) - Bill gave me a call from Saskatchewan Canada - and he was very loud - 599! He was running 100 watts into a yagi, so I am sure that helped. He dropped his power to 5 watts and I could still copy him very well. We had a nice chat, and a nice two way QRP QSO! KF7WJY (14522T) - Tim returned my call from Nevada, but we both had very weak signals 339 both ways. It was a slug, but we managed to finish up the QSO. Thanks Tim! KG7VTO (14714) - Bob called me with a 559 from Pendleton, OR. After reading his QRZ page, and looking at his SKCC number, I figured out he is a pretty new ham. He just got his ticket fall of 2015 and joined SKCC in December 2015. Bob had a nice fist and it was a pleasure to work a newer ham - glad you were bit by the CW bug Bob! W4RMM (2471T) - last QSO of the day goes to Bill from Alabama! He was pretty weak here in Kansas with a 339, and he gave me a 449. We kept it short because I had to get back to work. Thanks to all that answered me - you provided me a truly enjoyable lunch time portable operation! What a fun day on the radio! I picked up several new SKCC numbers towards my Centurion Quest, and just had a fun time with the J-37 key. The map of the Reverse Beacon Network from my calling CQ today - pretty impressive! Sorry for the confusion - those are their SKCC member numbers. You can find out more here: http://www.skccgroup.com/ Thanks for reading!